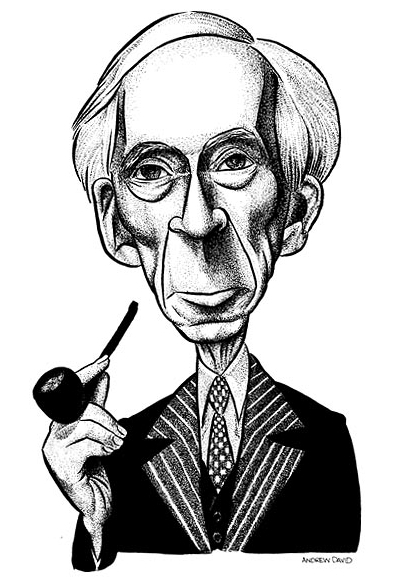 I'm reading Bertrand Russell's collection of essays, "In Praise of Idleness," an intriguing idea (the praise, not the collection of essays) for modern Western society, especially the American one, where idleness -- as Russell remarks -- is frowned upon as a waste of "productive" time. Among the radical ideas Russell puts forth is that we have the technology that would enable us to work about four hour a day, and employ the rest in relaxation and cultural activities, or in volunteer work. But, he quickly points out, we are raised in a society for which something like that would be unthinkable, because the people at the top of the economic ladder have never liked those below to have leisure time, and even less to improve their lot. You never know, educated people might start thinking critically, which may lead to dire consequences for the establishment. "I think that there is far too much work done in the world." "The road to happiness and prosperity lies in an organized diminution of work." "[Work] is emphatically not one of the ends of human life." "The modern man thinks that everything ought to be done for the sake of something else, and never for its own sake." "The notion that the desirable activities are those that bring a profit has made everything topsy-turvy." Pretty revolutionary stuff, for being written in 1932, eh? Bertrand Russell, in his collection of essays entitled "In Praise of Idleness," goes on to discuss the role of "useless" knowledge in our society. By this he means knowledge that is valued for its own sake, regardless of any particular practical application (in a way, similar to the way we value art for its own sake, regardless of how much money we may make by selling that Picasso we all have in our attic). "Learning, in the renaissance, was part of the joie de vivre, just as much as drinking or love-making." Interesting comparisons there, no? Indeed, one can get -- in a metaphorical sense -- inebriated by intellectual pursuits (even drunk, perhaps? ), and certainly the sudden joy of discovery can be compared to love-making (though usually the sensation of release isn't quite that overwhelming...). Russell becomes very worried about the tendency of modern society (he was writing in the 1930s) to reduce the size of its vocabulary, to make language more "practical." One consequence of this, he argues, is the potential loss of literary flourishing and of a sense of style in writing and reading. But of course, as Orwell magisterially pointed out in "1984," a much more dangerous result is the inability of people to think about certain thoughts -- especially those that are dangerous to the establishment -- because of a lack of appropriate words. Words and concepts are closely related, one can hardly have the latter without mastering of the former. Russell, of course, isn't saying that practical knowledge isn't, well, useful! On the contrary. But there is no need why that has somehow to be seen as opposite to theoretical knowledge: culture isn't a zero sum game, and the more the better. Most importantly, Russell points out that too much focus on practical results often leads to nervous breakdowns, or at least to unpleasant levels of stress; moreover, lack of culture affects human behavior in a most decidedly negative manner, including that of children. As he puts it: "The bully in a school is seldom a boy whose proficiency in learning is up to the average. When a lynching takes place, the ring-leaders are almost invariably ignorant men." "Finance is more powerful than industry when both are independent, but the interests of industry more nearly coincide with those of the community than do the interests of finance." This is exactly the sort of problem that brought us -- 70 years after Russell wrote -- Enron and the whole Wall Street mess. The idea is that capitalism, if it has to work, has to be based on certain rules ("managed capitalism," they call it in Europe). One of these rules is a tight coupling between investments (capital) and the products of the industry one is investing on. In turn, this means that things like day trading and other short-term "investments" are not investments at all (because there is no time for the industry to actually use that capital and deliver a product), they are speculation. And speculation is gambling pure and simple. We now live in a society in which, for some bizarre reason, it has become normal to accept the idea that people can "make a kill" on the market and become millionaires overnight. Usually, of course, on the skin of thousands of others who either lose their money or their jobs. This is nonsense on stilts of the highest order. Russell is always a good read. Thanks for sharing this. “We as a nation must undergo a radical revolution of values. We must rapidly begin the shift from a thing-oriented society to a person-oriented society. When machines and computers, profit motives and property rights, are considered more important than people, the giant triplets of racism, extreme materialism, and militarism are incapable of being conquered.” -- Rev. Martin Luther King, Jr. It's always good to see another Russell essay. I recently published my own ode to Russell at my blog. I always find it amazing how timely his observations still remain, I think it's partly due to his complete lack of obeisance to received wisdom and orthodoxy. Few (if any) philosophers were as adept at bridging the gap between academic philosophy and public intellectualism. Interesting way to connect his ideas to our modern economic injustices. The role of a financial sector is supposed to be solely to generate capital for more socially beneficial pursuits. Instead we have an out-of-control Frankenstein monstrosity. Wall Street has built a giant casino on top of the rest of the useful economy and seen fit to take the worker's only real source of capital (their homes) as poker chips. The politicians have done nothing substantial to address this important moral issue, Obama included. LOL, I just noticed on my re-visit that this is a re-post from several years ago. Still a god one though. The say Hobbes said "Leisure is the mother of philosophy" or something like that. I have dedicated the rest of my life to the idea. No results yet, but I'll keep (not) trying. We jumped on Bertrand's bandwagon this year and made the move to part-time work. Unless you're one of the fortunate few who find themselves doing work that's making a real difference in the world, reducing the hours spent "on the job" is a MUST. Life is far too short to spend it shuffling paper in some office. Too many books to read, podcasts to listen to and walks to take!! While the full spectrum of negative unintended consequences cannot be determined with any clarity, an immediate and probable impact of such a regulation would be to make raising capital far more difficult for nascent publicly-traded corporations, most of whom are rather small operations. In end, however, business growth would probably be significantly curtailed. I should add that I find the general tone of Russell's essay to be unpalatably moralizing; I see no inherent superiority of 'idleness' over the Protestant virtues (so-called) of hard-work and industry, and vice versa.